The wine region we know as Chianti, running throughout the Tuscan landscape from Florence in the north and spreading south to the medieval town of Siena, is one of the oldest geographically defined wine regions on earth. Winemaking in this region can be documented as far back as the 13th Century. The first defined boundaries of the Chianti Wine Region were set in 1716 by The Grand Duke Cosimo III de Medici. The area now known as “Chianti Classico” contains the original, historic center of the region. Its wines are considered to be the “original” wines of Chianti and the best. Winemakers in Chianti Classico guard the vineyards, the wine, and their region’s reputation fiercely. 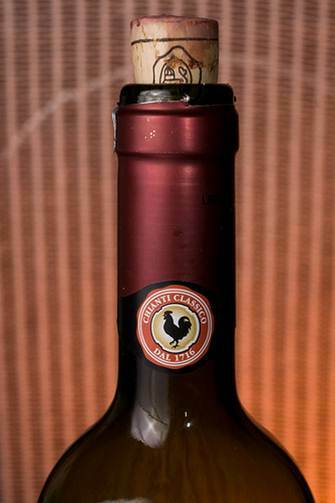 In 1924, a group of grape growers and winemakers formed a group to promote and protect the image of the wines of Chianti Classico and took as their symbol the Gallo Nero, or Black Rooster. In 2003 the Italian government gave the group, known as the Chianti Classico Wine Consortium, regulatory control of the entire production of Chianti Classico, and all the wines of the region now bear the symbol of the Black Rooster. The legend of the Black Rooster dates back to a 14th century boundary dispute between Florence and Siena. After a long and drawn out battle, the two Republics settle the issue with a race between two knights on horseback. According to the rules of the match, the knights would set off from their respective homes upon the crow of the rooster, in other words – you would think – at dawn. The knights would race along the road between the two Republics, and where they met in the middle would be the official boundary line between Florence and Siena. The townspeople of Siena chose as their representative a white rooster. In order to make him a happy, strong singer, they fed and pampered their rooster until the appointed day. The people of Florence chose a black rooster and fed him very little, so little in fact, that on the morning of the contest he was so hungry that he woke up several hours before dawn, and crowed and crowed until he was fed. Thus, the knight from Florence raced off for Siena in what was basically the middle of the night. Not surprisingly, he covered most of the road between the two Republics before he met up with the Knight from Siena. As a result, almost the whole of the land of Chianti was annexed to the Republic of Florence and the “Black Rooster”, or “Gallo Nero” became the symbol of the Republic of Florence. 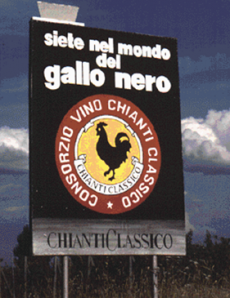 The Gallo Nero became the symbol of the original “Lega di Chianti” in the 16th century.